This past Sunday was my official last day as Stuff Manager in my home and also marked the end of the 40 Bags in 40 Day challenge and I’m happy to report that well over 40 bags of belongings have left this house to find new homes (or in some cases, the bottom of a trashcan). But before I delve into a lessons learned kind of post, I want to take a minute to reflect on the space this has created in our home. Because here’s where the rubber meets the road for so many of us caught in a binge/purge cycle of consumption; we fill the spaces we’ve created with the objects of least resistance instead of allowing them to become the spaces we fill with our intentions for our lives. Whether the new empty spaces are a few shelves in our basements, some hangers in our closets, or an entire room, it’s time to ask ourselves a few questions before making any decisions. What values define me or my family? Does my home reflect those values in its use or space or even decor? What activities do I want to create more time and space for in my life (and subsequently, home)? What brings me or my family joy? If you’re playing along, take a look around your home and ask yourself if you see the answers to these questions reflected in your choices of belongings, decor, or even the purposes you’ve assigned to each room. For instance, if you said that creativity is a high value for your family and you want to make more time for music, but all of your instruments are stored in their cases in a corner of your basement, your home is not acting as a conduit for your values. The good news is, we’re grown-ups and so we get to make whatever choices we want about our homes. That formal dining room that you eat in once a year and serves as china storage the other 364 days? Get this, you can actually turn that room into a music room. I know, it’s crazy. You can take the table out of the room and move your instruments into the room and even hang on them on the walls. “But wait, then I won’t have a formal dining room!” Yes, I know. You won’t. It’s okay. I’m going to let you in on a little secret. There are actually no home decorating police that will stop by your house and fine you if you use the space differently than the builder intended. You can do whatever you want. Your home does not have to look like a model home. Repeat after me: “HGTV, you are not the boss of me.” Doesn’t that feel kind of good? I want to share a couple of examples of some home design rebels I know in real life. They’ve chosen to change up the way they use their space to amplify the things they love and so far, no one has gotten arrested. This is my friend Kristen’s home. Kristen is a knitting evangelist. 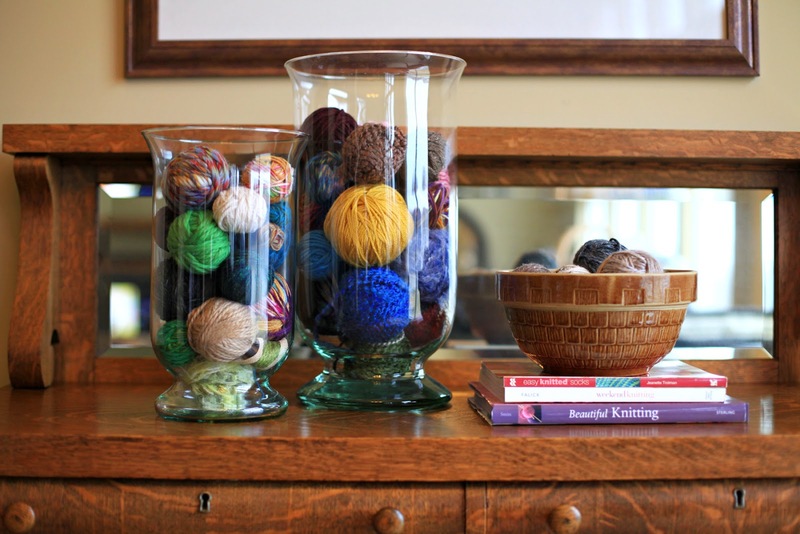 Not only does she arrange weekly knitting gatherings in various places all over town (I’m convinced she plans them in public places to convert non-knitters to her yarn-addicted ways) but she also leaves yarn around the house in both beautiful and functional ways. This allows her to grab a project at any time, and also to offer one to a friend. These balls of yarn aren’t just decoration. You are welcome to grab one and start a project at Kristen’s house, she’ll even get you started. 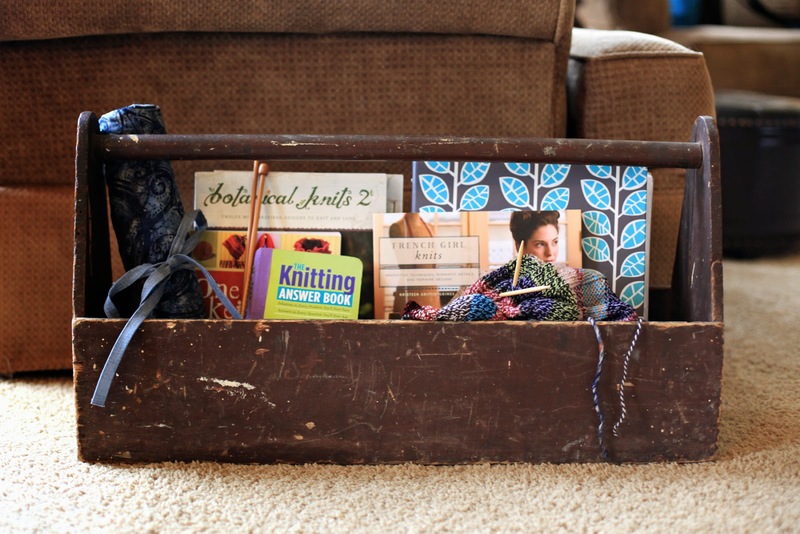 Kristen keeps her needles and current projects right by the couch so she doesn’t have to search when she’s ready to knit. 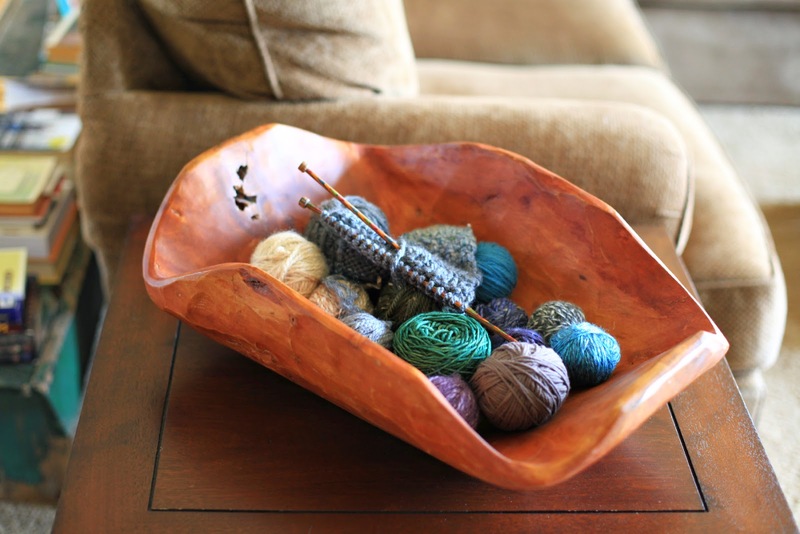 Kristen calls this a “friendship knitting bowl.” Anyone can pick up the unfinished project and work on it, and she’s used this as a teaching tool as well. This next home belongs to my friends JuLee and Jeff. JuLee and Jeff are board game enthusiasts. When I first met JuLee, they had a cute gaming space set up in their finished basement. In my book, they’d already accomplished the goal of creating space for something they loved, but they took it a step further. 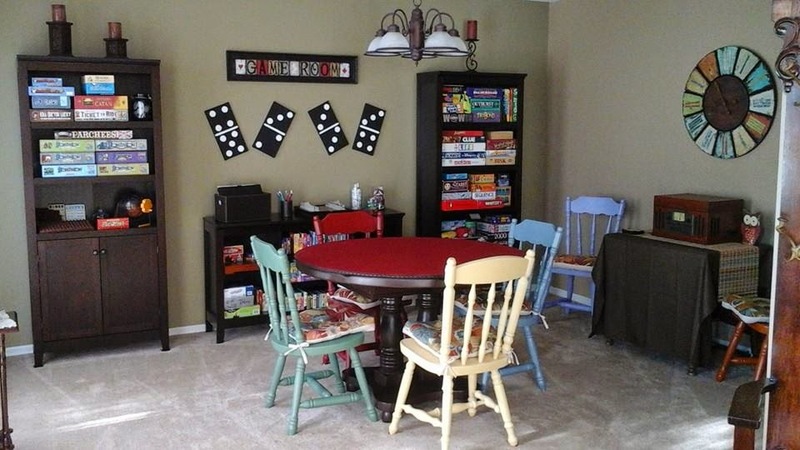 They decided to bring the board games that had unified their family front and center by turning their formal living room into a game-themed playing room. I love the way they boldly declare their passion by giving it such prime real estate in their home. JuLee and Jeff’s game room is the first room you see when you enter their home. So, as this challenge comes to a close, I’m thinking about ways I can take back my square footage. 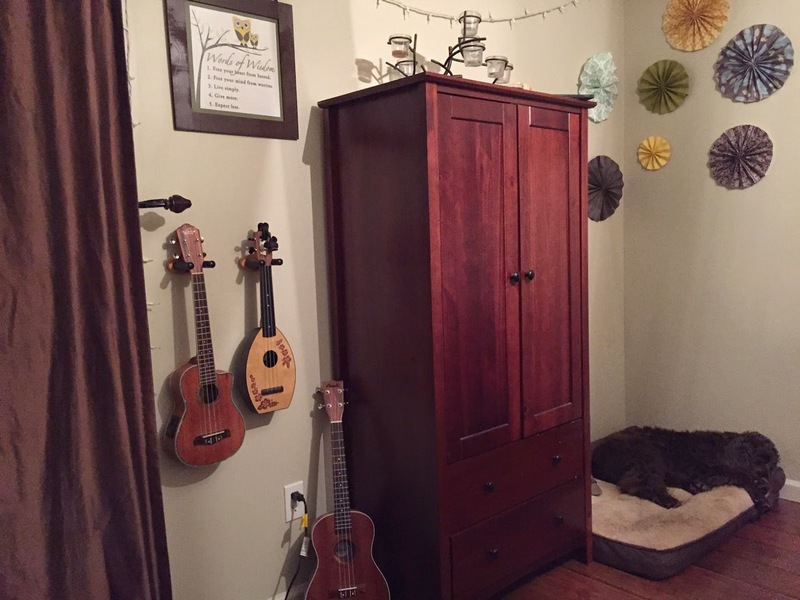 I’ve ordered some extra ukulele and banjo wall mounts so our instruments can be available in both our bedroom (where they currently live) and our family room (the other room where we often play). I’m re-purposing a shelf next to my dining room table to hold all of our art supplies so they are at an arm’s length when we are sitting down together at the table. I’m handing over the newly empty storage area under the basement stairs to the boys to dream up ideas for a hideout. And mostly, I’m giving thought to any item that enters our home before allowing it to take up any of the space that we’ve created. We’ve got more ukuleles than we know what to do with. These wall mounts are sort of essential in our home. How about you? Is there a room in your house that is rarely if ever used? Could it be re-purposed into a space that will bring more joy into your life? Or perhaps you live in a small space and don’t have an entire room to re-purpose; could you find ways to incorporate your passions into the space you currently use the most? Or could you sprinkle it around the house, like Kristen does with yarn? Share your ideas, or if you are already a home design rebel, share a picture! I would love to see how you are filling your space with intention. This post is part of a series on quitting your job as a Stuff Manager. Drop back in to read more about my journey over the next forty days, or subscribe by email if you don’t want to miss a post! I look forward to hearing about your own resignation.